In this problem set the students use two different equations to calculate a conductive geothermal gradient using a spreadsheet program like Excel. Once they have the geothermal gradient plotted, they are asked to experiment with and comment on the model by changing parameters (e.g. mantle heat flow, thermal conductivity). There is a mix of specific, fill in the blank questions and open-ended questions. 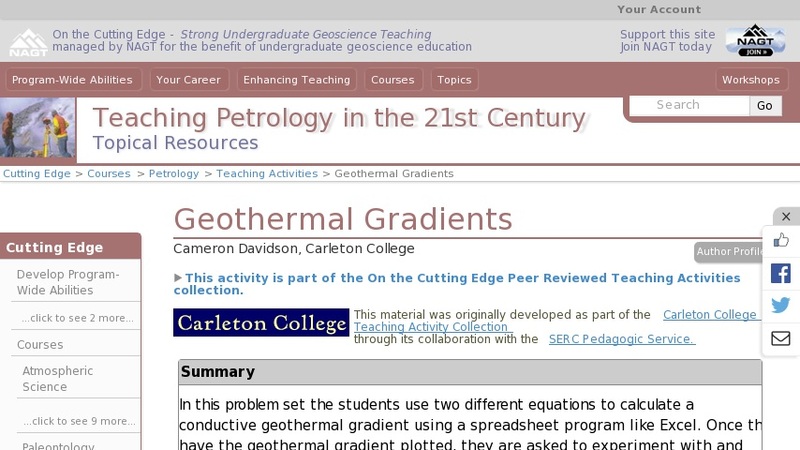 This problem set helps develop quantitative problem solving skills using a spreadsheet as a tool, and forces students to think about thermal constraints during igneous and metamorphic processes.